Flannel is an extremely soft, napped fabric, usually made of cotton, but sometimes of wool. In some cases it can be napped on both sides, but usually it’s smoothly woven on one side and very soft and fuzzy on the other. Because of its inherent warmth, it’s suitable for pajamas, blankets, long-sleeved shirts, and as a lining for coats or jackets. Because flannel is somewhat thick, it doesn’t lend itself well to intricate embellishment such as shirring or ruching. It can be gathered or pleated, but keep the design simple. Flannel is quite easy to work with, though it does tend to fray. It also shrinks when washed, so pre-wash your fabric at least three times to be sure it won’t shrink further once your garment is sewn. Finish all of your seams, either enclosing them with flat-felling or French seams, or by trimming them with pinking shears and running a zig-zag stitch along the edges. Reduce bulk wherever possible: clip corners, trim all seams, and clip or notch all curves. Use a medium-weight universal needle and do a test sample to determine if you’ll need to adjust your tension or increase your stitch length to accommodate the thickness of the fabric. Use large pins; smaller pins will tend to bend from the thickness of the fabric. 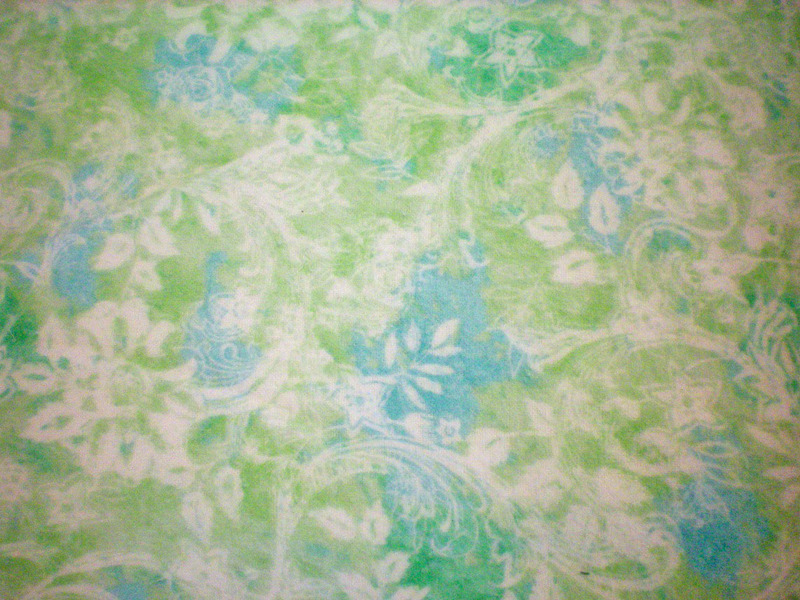 I have here a pretty cotton flannel printed with a mint green and blue background wash, and a cream floral overlay pattern. It’s quite soft, with an almost halo effect from the fuzzy print. I bought five yards at $4.99/yd at Fabric.com. 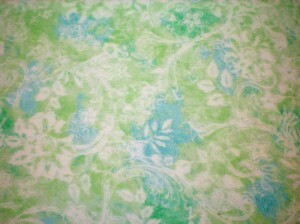 It’s my intention to make a pair of winter pajamas from this fabric. The result should be nice and warm for the chilly winter nights. Have you worked with flannel recently? Did you find it easy or challenging? This entry was posted in Saturday's Stash and tagged Fabric, Saturday. Bookmark the permalink. Muito bom esse comentário, estou costurando as tais flanelas fazendo paninhos para bebe, meu netinho ou netinha. Aqui no Brasil e costume fazer esses panos geralmente chamados de cueiros. Servem para enrolar os recém nascidos, forrar carrinhos ou qualquer outro lugar. São uns tecidos ótimos para se costurar, os meus são algodão tecido de um lado e o outro um pouco desfiante bem mais macios. Estou fazendo em volta com viés e outros com bordado inglês, passa fita , estão lindos. Minha dúvida era qual o lado ficaria em contato com a pele do bebe.